Petter Solberg gets suspended ban over speeding offence. Comments Off on Petter Solberg gets suspended ban over speeding offence. Petter Solberg has been given a suspended ban from Rally Sweden after being caught speeding on a road section during the Monte Carlo Rally last night. 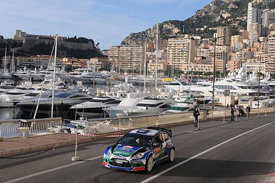 The Ford driver, who finished third in the event, was caught doing 106km/h in a 50km/h limit at 21.10 local time on Saturday, following the final stage of leg four. The stewards felt Solberg had infringed article 151c of the International Sporting Code by committing an “act prejudicial to the interest … of motor sport generally”. Solberg was given a reprimand, a 1,400 euro fine and a suspended ban from the next event he contests, which will be Sweden. But the ban will be imposed retrospectively “should the driver commit any speeding offence of 50 per cent or more of an applicable speed limit in any of the next six WRC rallies in which he participates during the 2012 season” – so he risks disqualification from Sweden if caught speeding again.